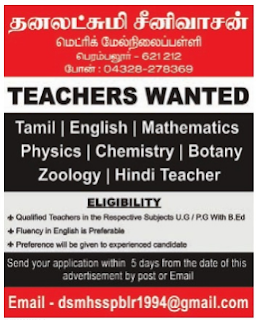 Dhanalakshmi Srinivasan Matric High School, Perambalur has advertised in THE Dinamalar newspaper for recruitment of /PGT jobs vacancies. Interested and eligible job aspirants are requested to apply with in 5 days. Check out further more details below. Name of the School: Dhanalakshmi Srinivasan Matric High School, Perambalur. About School:Dhanalakshmi Srinivasan Higher Secondary School is a renowned institution in Perambalur. Our venerable founder Sri.A.Srinivasan an extraordinary educationist of indomitable will and courage founded this institution in the year 2004 with the farsighted vision of empowering rural students through education and making them economically self-reliant. How to Apply: Interested candidates are requested to apply with in 5 days by post or email. Reference: Advertisement on THE Dinamalar newspaper Dated 29th May 2018.